Abbas even went to France to convince Macron to take over the US role. More and more details emerge about what caused Palestinian leader Mahmoud Abbas to finally drop his self-styled mask as a ‘moderate’ and ‘peace-seeking’ leader and to declare the Oslo accords dead, label Israel a classic European colonial project and curse president Trump repeatedly during a two-hour anti-Semitic rant before the central committee of the PLO in Ramallah on January 14. At the same time, Abbas is trying to convince French president Emmanuel Macron to take-over the role of an honest broker from the U.S. in the moribund peace process. The story started on December 3, 2017 when the New York Times (NYT) reported Abbas had traveled to meet Saudi crown prince Mohammed Bin Salman (MBS) in Riyadh, Saudi Arabia to discuss details of Trump’s new peace initiative for the 100-year-old conflict between Jews and Arabs in the land of Israel. MBS told the Palestinian leader he would get a non-contiguous state with only limited sovereignty and without Jerusalem as its capital. The Palestinian leadership furthermore was expected to relinquish the so-called right of return, according to the NYT. The conversation with the Saudi crown prince left Abbas flabbergasted and extremely upset according to PA officials. Once back in Ramallah the Palestinian leader, who is now in 14th year of a four-year term as ‘president’ of the PA, started to make phone calls to friendly leaders in the Arab world and Europe and finally found a valued listener in French president Emmanuel Macron. After Trump’s December 6th declaration about Israel’s sovereignty over all of Jerusalem Abbas apparently slowly began to understand that the rules of the game in the 100-year-old conflict are changing dramatically and he would not enjoy a free pass any longer. "President Trump's announcement on Jerusalem gave Israel a license to kill Palestinians. Trump has committed a crime against the Palestinians, who will never give up their lands and holy sites," Khalil said at the time, adding "the era of resistance" had now begun. Shortly after the start of this campaign, Fatah began organizing “days of rage” in Judea, Samaria, and Jerusalem where Turkish dictator Recep Tayyip Erdogan is openly meddling in internal Israeli affairs and is funding Islamist organizations who organized the violent protests. The call came after Palestinian terrorists murdered Rabbi Raziel Shevach in a drive-by shooting attack in Samaria. Abbas, meanwhile, put a good deal of energy into finding an alternative for the United States as a mediator in the conflict with Israel - and even went to Paris to convince French president Emmanuel Macron to intervene and to take over the role as honest broker. The ambitious Macron is on a mission to restore France’ lost clout in the Middle East and earlier made clear he doesn’t share Trump’s vision on the Israeli Palestinian conflict and remains a supporter of the so-called two-state solution. “I would like to make clear there is no alternative to the two-state solution,” Macron said during a press conference after his meeting with Abbas on Dec.22, 2017. 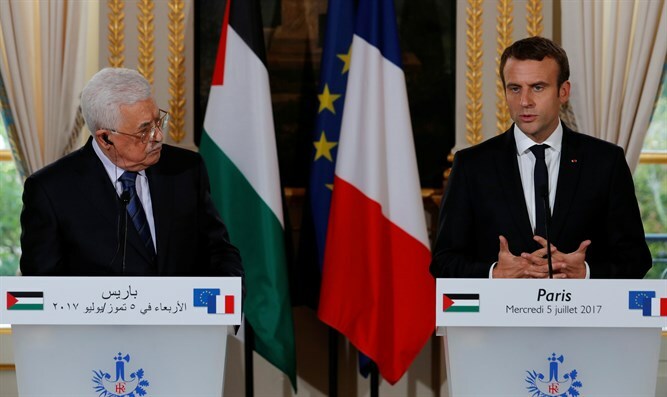 “Jerusalem should be the capital of both states,” the French leader added before praising Abbas for his “commitment” to a peaceful solution to the crisis. 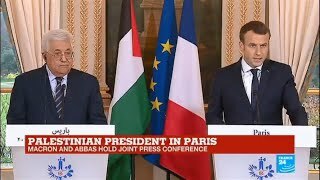 “From the very beginning he has shown great responsibility and has called for calm,” added Macron while Abbas visibly enjoyed the flattering statements by the French leader. Macron also repeated the old canard Jewish villages and towns in the so-called 'West Bank' are undermining “Palestinian sovereignty” and frustrate “political prospects”. With his comments, Macron departed from the self-invented foreign policy doctrine he calls “Gaulle-Mitterandisme,” which is, according to the French president, a mix of realism, French exceptionalism and a great willingness to find solutions to conflicts via negotiations. With his pro-Palestinian stance, Macron also disqualified himself as a possible intermediary in the escalating conflict between the Palestinian Arabs and Israel. After Abbas falsely claimed he wouldn’t be able to control his comrades in Fatah Macron tried to dissuade the Palestinian leader from starting another war against Israel. When he saw that the situation on the ground is not improving, Macron, sent his deputy national security adviser Aurélien Lechevallier to Ramallah in a new effort to calm Abbas and the PA.
Macron did this after conducting several phone calls with US president Donald Trump. The POTUS further upped the pressure on Abbas last week by threatening to cut off financial aid to the Palestinian Arabs altogether if the PA doesn’t return to the negotiation table. Lechevallier met, among others, with Saeb Erekat the PA’s chief negotiator and the new secretary general of the PLO. The Macron envoy asked Erekat to refrain from any unilateral actions and not to use violence until the Trump’ peace plan is released. "You might be right and the plan might turn out to be bad but don't blow it up right now,” Lechevallier told Erekat and the other PA officials while adding they should first read the plan before throwing it into the trashcan. It’s highly doubtful, however, that Erekat and Abbas will heed the French advice. Last week, the Hadeshot news show revealed it was Erekat who urged Abbas to reject out of hand Trump’s plan for a solution to the Palestinian Israeli conflict. Erekat recently traveled to Riyadh where he received a copy of the 92-page peace plan from MBS. When he realized that almost none of the Palestinian maximalist demands – including the so-called right of return- would be met under Trump’s 'deal of the century' Erekat told Abbas there was no reason to wait for the publication of the American peace proposal and called the plan a “dictate”. Over the weekend Abbas again said the Oslo accords were now indeed dead, while Macron appeared engaging in damage control vis a vis Israel..
During a meeting with Netanyahu at the World Economic Forum in Davos, the French president repeated his call for a two-state solution but also vowed he would not recognize an independent Palestinian state at this point. Macron furthermore, claimed he was a “partner for the security of Israel” and Israel’s “strategic partner for the whole region.